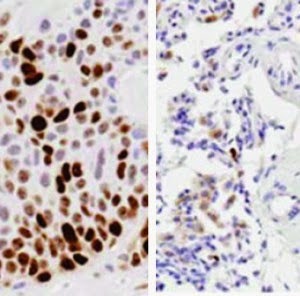 staining for a marker of tumor growth. Pancreatic cancer cells are notorious for being protected by a fortress of tissue, making it difficult to deliver drugs to either shrink the tumor or stop its growth. Now researchers have developed a device that could change all that: By using electric fields, the device can drive chemotherapy drugs directly into tumor tissue, preventing their growth and in some cases, shrinking them. The work, published in Science Translational Medicine, opens the possibility of dramatically increasing the number of people who are eligible for life-saving surgeries. It represents a fundamentally new treatment approach for pancreatic cancer, which has a 75 percent mortality rate within a year of diagnosis - a statistic that has not changed in more than 40 years. Depending on the tumor type, the new device can be used either internally after a minimally invasive surgery to implant the device’s electrodes directly on a tumor (an approach relevant especially for pancreatic cancer and other less accessible tumors) or externally to deliver drugs through the skin (an approach relevant especially for treating inflammatory breast cancers and other accessible tumors such as head and neck cancers). Researchers have also demonstrated the device’s ability to enable higher drug concentrations in tumor tissue while avoiding increased systemic toxicity. This is especially important in treating pancreatic and other solid tumors, which are not well vascularized and are thus difficult to reach using standard treatment methods that rely on the bloodstream for delivering cancer-fighting drugs to tumors. The researchers hope the invention can be used in humans in the coming years and result in a notable increase in life expectancy and quality among patients diagnosed with pancreatic and other types of cancer. Below is a video demonstrating how electricity can be used to transport chemotherapy drugs to hard-to-access tumors. A drug surrogate (blue dye) is transported from the implanted device through a tissue surrogate (agarose gel) to the counter electrode. The bubble formed on the counter electrode is an inert side product of the electrochemical reaction at the electrode interface. Based on material originally posted by UNC Health Care.